Servo drive with lead screw gives an gives an advanced drive system with 1 to 1000 standard speed range. Computerised Microprocessor based Instrumentation to measure display & store load & Displacement values. Provision for load cell interchangeability & thereby automatic selection of lad full scale. Speed selection through selector switch in steps or variable speed selector through potentiometer. Built in parallel interface to connect printer for data & curve print-out. Safety interlock for overhead & limit switch sensing to ensure protection test. The electronic control panel is built using 8085 microprocessor which incorporates sate of the art technology with following features. 7 seg digital display of load & displacement / extension. Printer port for printer / plotter interface. Optional series port for communication with PC / AT etc. Optional add on facility for electronic extensometer. Storage on important parameters such as peak load, displacement at preload & maximum displacement after test. 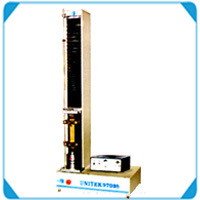 Selection of test type like tension, compression, or cyclic by key board. Preload selection ( 0.01 to 1 % ) by thumbwheel to take care of initial slippage. Selection of stop or return crosshead after test. 100N, 250N, 1kN, 1.2kN. Load cells of different capacity can be offered as per customers requirements. Electronic analog extensometers are offered along with interface card on the control panel to measure extension with a resolution of 1 micron. For complex test analysis the Unitek 9700 series machines can be offered with and optional serial port to establish communication with PC. The TNE – 9700 series control panel can be hooked to any PC/AT etc., using RS-232 communication port which is offered as optional. FIE offers different exhaustive application software package on PC to enable the user to effectively different parameters. User friendly main menu with popup/pulldown menus, prompt message & on line help. Printout option for Reports, Data, Graph etc. 1) Basic Evaluation 2) Exhausitive Evaluation 3) Rubber Textile 4) Compression shear & bending. 5) Spring Testing. Statistical Evaluation software can be offered for all these program as optional. FIE also can provide custom built software solution to suit customer requirement. +/-1% from 2% to 100% of nominal load of loadcell used. +/- 1% from 2% to 100% of nominal load of loadcell used. Crosshead displacement resolution of 0.01 mm. The power requirement of each model depends on the speed range and the capacity of the machine.